Does anyone know what this weed is? 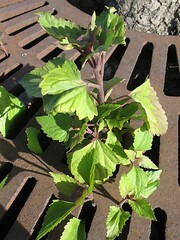 As I was walking to the carpool from work (San Francisco), I saw this weed growing through the grill underneath a street tree. 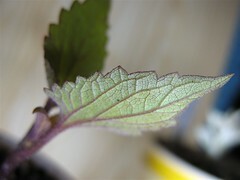 I thought is was cool, so I took a few cutting of it to try to root. 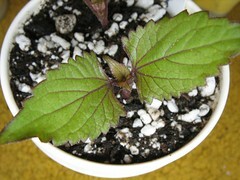 The stems are reddish brown and slightly hairy. The main stem seems semi-woody, since I could not pinch it off. Anyone know what this is? 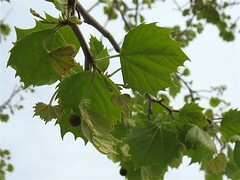 Here is a close up of the leaves. Added May 16: I went back to check to see if this "weed" was really a sucker from the tree it was under. After seeing it, I don't think it is, since I also another of this "weed" at another location that was not under a tree. 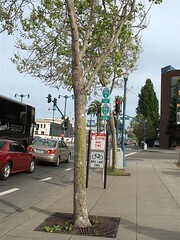 Is it an Elm tree? Oh MY! They really look identical! Even the kind of lines on his feet and the silver tips. But he's got some kind of weird eye thing, too, and can look crosseyed at times. His eye problem was being born without that second eyelid, and he had surgery when he was rescued. It's amazing how much they look alike! Are you in Seattle by chance? He's just the best cat, so sweet, so happy. I call him my velvet teddy bear. That picture above could BE Jack, down to the winky eye...it's just amazing. Awww, wow, Jack has quite the story! I'm not from Seattle - Alberta, Canada, actually. Here's Ma'ti's story: when I was about 15 (I'm 24 now) my sister and I found a litter of abandonned kittens under a porch in our neighbourhood. We took them home and bottle fed them until they were old enough to eat hard food. Our mom said we could choose one cat to keep (we already had one cat), and we chose Ma'ti. We had to give the other four kittens away. But we're glad we kept Ma'ti. :) She was the cutest and her wonky eyes were so adorable. It was a bit strange because she was the only one of her brothers and sisters with her colouring. The others were black and black and white. 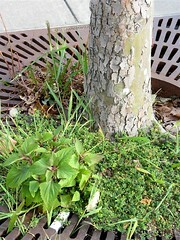 It looks like a tree shoot (a sucker), do the leaves look similar to the tree it was under? I get suckers sprouting up all over my yard from my cherry tree including up through the slats in the deck. its not a hibiscus is it?